First off I would like to mention that this is a free pattern and more importantly, a fairly simple pattern to modify. The weight of yarn and tension can be important as it determines the finished size of your garment. 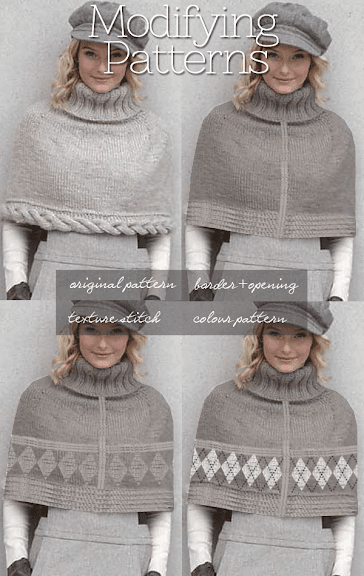 In this case whether the capelet is an inch or two longer and wider is not a tragedy, but garments that are heavily cabled or have a specific sizing and structure are recommended only for knitters with strong stomachs and lots of patience. I have neither, so this example is perfect. Modifying in this case is really tweaking. We are making minor changes to stitches and measurements (hopefully, if your tension is not way off). Not crazy about the bulky cable at the bottom of the capelet. Want a zipper or some kind of front closure - hate over the head turtlenecks. Love texture and easy, so I want a border of texture, but a relatively simple stitch. Read further for changes and stitch pattern suggestions. Size 6.5 mm (U.S. 10½) knitting needles. Size 6.5 mm (U.S. 10½) circular knitting needles 24 ins [60 cm] and 36 ins [90 cm] long or size needed to obtain tension. TENSION 14 sts and 18 rows = 4 ins [10 cm] in stocking st. NOTE: The cable portion of pattern has been eliminated. NOTE: Capelet Body Instruction changes are in CAPS, number changes in colour . 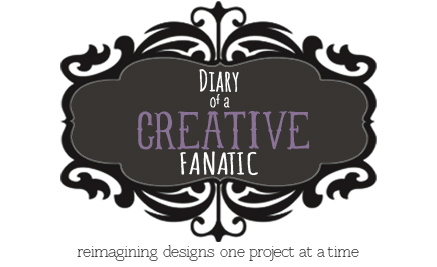 NOTE: Only the first size has been reworked - the size fits x-small to large. With RS facing and longer circular needle, CAST ON 164 sts working back and forth on circular needle. NOTE:We are working back and forth because we now have a front opening for zipper or bands of some kind. NOTE:The numbers changed from 160 to 164 sts plus 1 to 165 after the garter border is finished to accommodate the pattern multiple of 12 +1. 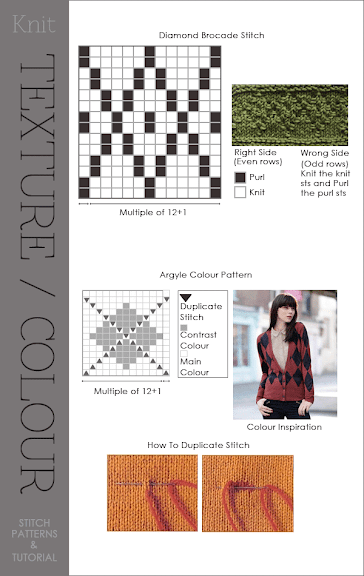 NOTE: The 3 stitch patterns - Argyle Twist, Diamond Brocade and Coloured Argyle are all a multiple of 12 plus 1, making it easy to choose any one of them or one of your choice with that multiple. 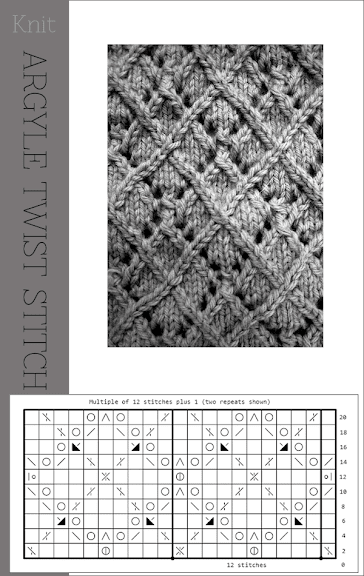 NOTE: As shown in images, after pattern(s) are completed, work 2 more ins of garter rows. Cont in stocking st until work from beg measures 12 ins [30.5cm]. NOTE: All numbers have changed in the dec rows of yoke, because of the opening in front. Dec rnd: K3, K6. K2tog. *K8. K2tog. Rep from * around to last 11 sts. K6. K2tog. K3. 146 sts. WORK IN STOCKING ST for 4 rows. Dec rnd: *K3, K5. K2tog. *K7. K2tog. Rep from * to last 10 sts. K5. K2tog. K3. 130 sts. Dec rnd: *K3, K4. K2tog. *K6 K2tog. Rep from * around to last 9 sts. K4. K2tog. 114 sts. Dec 18 sts evenly around next row and following 5th row 16 sts evenly . 80 sts. Next row: *K2. P2. Rep from * around. Cont in (K2. P2) ribbing until collar measures 9 ins [23 cm]. NOTE: Finishing: Insert zipper by sewing to front of capelet. The zipper will fit to end of ribbed collar. A simple rice st pattern would also be attractive and work up very fast. Buttonbands could be made in place of inserting a zipper.